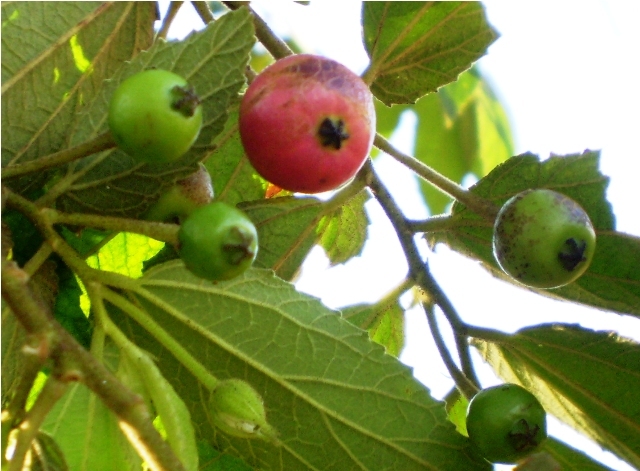 Jamaican cherry is a plant of tropical America. It has now spread to nearly all parts of the world having similar climate. 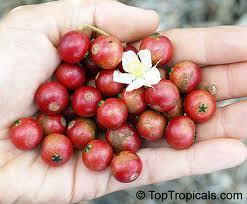 It is now cultivated in many countries for its fruits which are also offered for sale at many places. The flowers of this tree resemble strawberry bloom. Hence it is also called a strawberry tree which confuses it with Arbutus unedo. A very fast-growing small to medium tree, 8 to 13 m high, branches spreading, nearly horizontal. Leaves are alternate, lanceolate or oblong, long-pointed at the apex, oblique at the base. 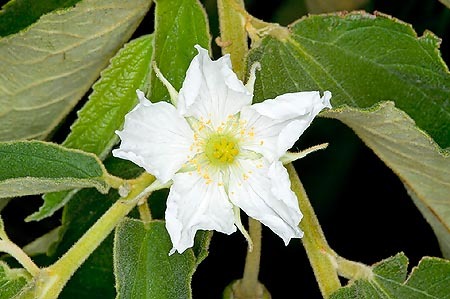 Flowers with 5 green sepals and 5 white petals and many prominent yellow stamens last only one day, the petals falling in the afternoon. Fruits round, 1-1.25 cm wide, with red or sometimes yellow, smooth, thin, tender skin and light-brown, soft, juicy pulp; taste very sweet, musky, somewhat fig-like flavor; filled with very fine seeds which even remain unnoticed while eating. The fruits of Jamaican cherry are eaten and sold in markets. The fruits can be processed into jams and other products. The leaves are used for making a tea in some countries. 100 gm of pulp contains, 77.8 g moisture, 0.324 g protein, 1.56 g fat, 4.6 g fibre, 1.14 g total minerals, 124.6 mg calcium, 84.0 mg phosphorus, and 1.18 mg iron and o.019 mg carotene. This fruit is a very good source of vitamin C containing 80.55 mg of this vitamin per 100 g of pulp. 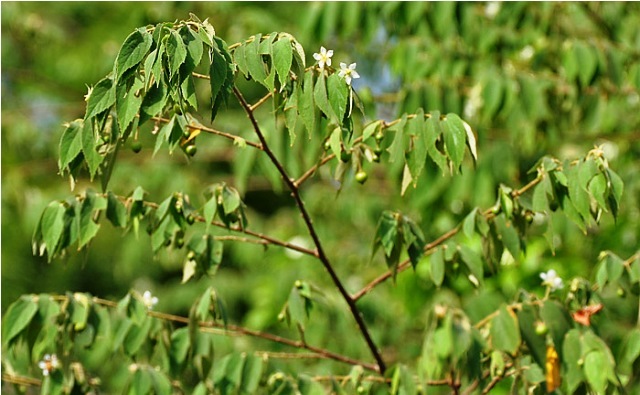 Jamaican cherry flowers are used as an antiseptic and to treat spasms. It is also taken to relieve headaches and colds. The tree yields a useful timber which is reddish-brown, compact, fine-grained, moderately strong, light in weight, durable, and easily worked. It is used to make small boxes, casks, and general carpentry. The dried timber is valued as firewood for cooking as it lights quickly and produces intense heat with little smoke. In Brazil, it is being considered as pulp for paper making. The bark is stripped to produce strong soft cord made into ropes. Jamaican cherry is a very hardy plant and can thrive in poor soil, able to tolerate acidic and alkaline conditions and drought. It can help to condition the soil and make it habitable to other plants. 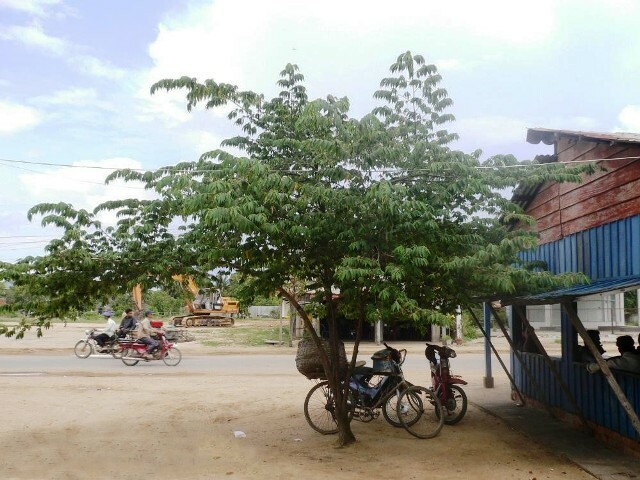 Besides being planted for fruits, this tree is being used in forestry projects. In India, it is planted in urban gardens for its ability to grow fast and attractiveness to small fruit eating birds such as the flowerpeckers. It is also commonly planted in parking lots. New plants can be raised from seed. The Brazilian growers sow seeds directly into the field fresh seeds mixed with the sweet juice of the fruit. The fruits are borne nearly all year, though flowering and fruiting are interrupted in Florida and Sao Paulo, Brazil, during the 4 coolest months. Ripe fruits can easily be shaken from the branches and caught on cloth or plastic sheets.